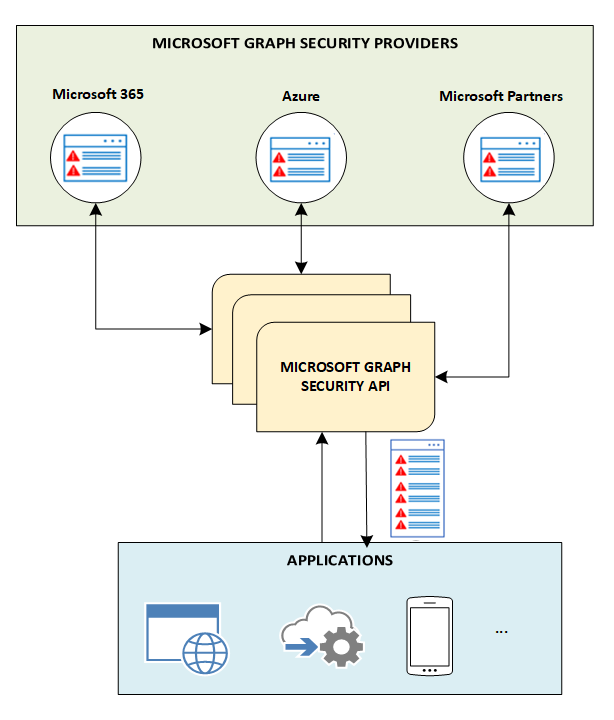 You can use the Microsoft Graph Security API to connect Microsoft security products, services, and partners to streamline security operations and improve threat protection, detection, and response capabilities. The Microsoft Graph Security API is an intermediary service (or broker) that provides a single programmatic interface to connect multiple Microsoft Graph Security providers (also called security providers or providers). Requests to the Microsoft Graph Security API are federated to all applicable security providers. The results are aggregated and returned to the requesting application in a common schema, as shown in the following diagram. For details, see Microsoft Graph Security API data flow. For information about authorization, see Authorization and the Microsoft Graph Security API. For information about permissions, including delegated and application permissions, see Permissions. Why use the Microsoft Graph Security API? Write code – Find code samples in C#, Java, NodeJS, and more. Connect using scripts – Find PowerShell samples. Drag and drop into workflows and playbooks – Use Microsoft Graph Security connectors for Azure Logic Apps, Microsoft Flow, and PowerApps. Get data into reports and dashboards – Use the Microsoft Graph Security connector for Power BI. Connect using Jupyter notebooks – Find Jupyter notebook samples. Connect once to integrate alerts from any Microsoft Graph-integrated security solution and keep alert status and assignments in sync across all solutions. You can also stream alerts to security information and event management (SIEM) solutions, such as Splunk and IBM QRadar, via Azure Monitor. For details about SIEM integration with the security API entities, see Integrate with a SIEM. Correlate alerts across security solutions more easily with a unified alert schema. This not only allows you to receive actionable alert information but allows security analysts to pivot and enrich alerts with asset and user information, enabling faster response to threats and asset protection. Dive deep into related security-relevant inventory (like users, hosts, and apps), then add organizational context from other Microsoft Graph providers (Azure AD, Microsoft Intune, Office 365) to bring business and security contexts together and improve threat response. Automate security management, monitoring, and investigations to improve operational efficiencies-and response times. Get deeper insights and context by integrating Microsoft Graph Security into your reports and dashboards. Visualize your data across different security products running in your organization to get deeper security insights. Discover opportunities to learn from the data and train your security solutions. The schema provides multiple properties to pivot on to build rich exploratory datasets using your security data. Automatically send your threat indicators to Microsoft security solutions to enable alert, block, or allow actions. Use the Microsoft Graph Security API directly or take advantage of integrations with leading threat intelligence platforms. Enable swift action to defend against new threats, such as actions to block files, URLs, domains, or IP addresses from within your security tools and workflows. Use the Microsoft Secure Score (preview) to provide visibility into your organization’s security needs and get suggestions for how to improve it, and project an improved score after those suggestions are incorporated. Easily measure your progress over time and get insights on specific changes that led to improvement in your score. The following table lists the benefits that different security solutions can access by integrating with the Microsoft Graph Security API. Streamlined integration with security operations tools, workflows, and reporting. Reduced deployment and maintenance time and efforts. Automated response to alerts by taking action on threats. Ability to deliver more value to MSSP customers. Smooth integration with Microsoft security solutions and ecosystem partners. Unified threat management, prevention, and risk management across various security solutions. Alerts, actions, and customer threat intelligence exposed through Microsoft Graph. Instant integration with Microsoft Graph-enabled solutions. Gain deep security insights to train other security solutions. Interested in becoming a security provider? Reach out to graphsecfeedback.